Compositor v3.0.1 is a major update, which fixes several bugs of Windows x64 version and first appearing in a Mac world of 3d installment of Compositor Software. Now you can run Compositor v3.0.1 natively on a Mac machine and use ReWire to sync to Ableton Live 9. Both versions are identical and give same results on PC and Mac systems. With Compositor v3 Hypervisor Radio Shack, named after the platform for running virtual machines inside one matrix, you have modular structure so be sure to choose the feeders you need to suit your style of translations. You can choose FF8 signal-rate quantized module for electric field sounds with LFO structure reminding a sound of copter drone engines. Smooth exponential TC25 for LFO like modulated granular synthesis. 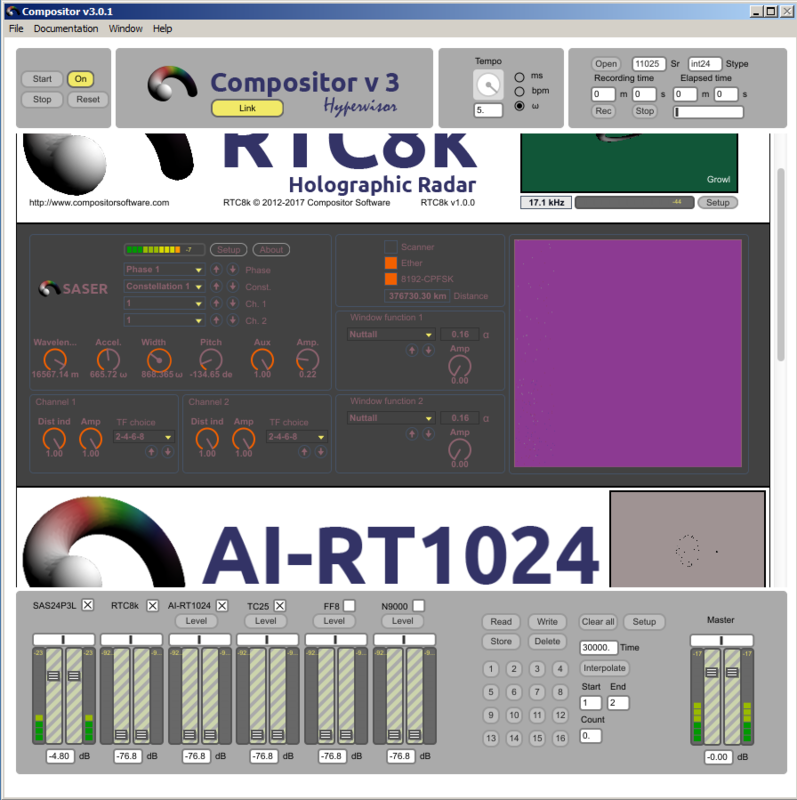 AI-RT1024 quantized real-time generator aimed to fill a niche of Compositor Pro 2 style and sound. N9000 exponential structure feeder for Compositor Max for Live like sounds. All feeders have the auto mode for completely autonomous simulations and one-dial parameter operation of patterns and algorithm tuning. It was made on a purpose for faster pattern selection of feeding generators in a live ensemble situation. You can also use all four feeders in the link mode to main RTC8k radar setting. This way feeder pattern will always follow current RTC8k radar setting for the initiated translation. Now you also have the visual feedback for RTC8k server signalizations. I named them in simple chat statuses style to be in touch with current automatic tuning of an algorithm. 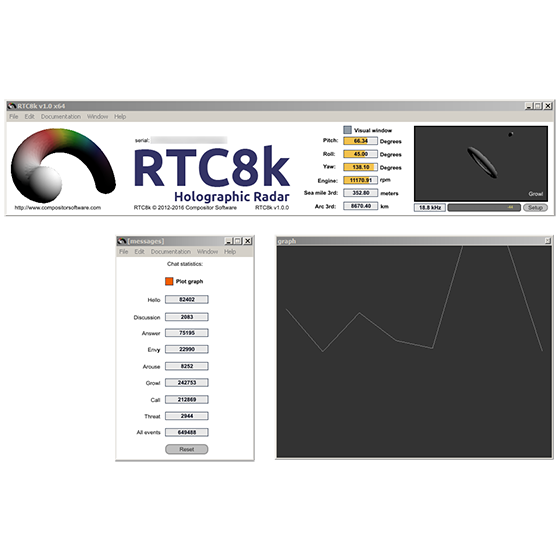 You can view their statistics and graphic curve of statuses appearance by pressing setup button for RTC8k radar. The main idea is to understand the generators disturbance behavior. If you experience dropouts in playback and other artifacts, check visual display of RTC8k for statuses like Threat, Call, Arouse and Envy, which are measured on a signalization average level. Overall, all these great features aid your interaction with an instrument and help to visualize audience reactions on a translation you run with Compositor v3 software.